In his first new book in six years, Donald Davis, considered by many to be the father of family tales, returns to recollections of growing up in the southern Appalachians, and especially of his relationship with his sibling Joe. Davis has remarked that he “didn’t learn stories, I just absorbed them” from a family of traditional storytellers that has lived on the same western North Carolina land since 1781. Among this collection of 18 chronologically arranged stories, Davis explains why 28 second-graders petitioned the school board to reestablish paddling as their preferred form of punishment, instead of the new policy of “suspension.” He also spins family tales about how his mother was finally convinced to give his brother Joe’s naturally curly, “wasted-on-a-boy” hair its first cut; how he and his cousin Andy got fired from their job of “watching the baby”; how his brother convinced their mother to adopt her first cats; and how he got a chemistry set designated for children over 10 when he was only eight. 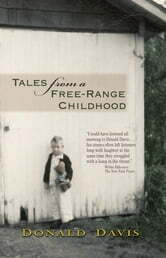 Through his tender, often humorous stories about his life experiences, Davis captures the hearts and minds of readers while simultaneously evoking their own childhood memories. One reviewer described Davis’s storytelling style this way: “He invites each listener to come along, to pull deep inside for one’s own stories, to personally share and co-create the common experiences that celebrate the creative spirit.” Even if you can’t enjoy Davis’s storytelling live, his written voice is so strong that you will actually hear these tales as you read them. Donald Davis grew up near Waynesville, North Carolina, before attending Davidson College. After earning a B.A. in English there, he graduated from Duke University Divinity School. For over 20 years, he was a minister in the United Methodist Church. In 1989, he became a full-time storyteller. He now tours the country 10 months a year, making approximately 300 storytelling presentations annually. Carolina, he conducts special week-long workshops on the creation and performance of personal and family stories. His workshops were the subject of a documentary film that premiered on public television in Utah in August 2010. He has been a featured storyteller at the Smithsonian Institution and the World’s Fair and a guest host for National Public Radio’sGood Evening program. He was selected for the “Circle of Excellence” by the National Storytelling Association and served as the chairman of the board of the National Association for the Preservation and Perpetuation of Storytelling for six years. When he’s not traveling, he makes his home on Ocracoke Island.